I really, really want to like gazpacho. It's full of healthy veggies, cool and refreshing, and pretty to look at. 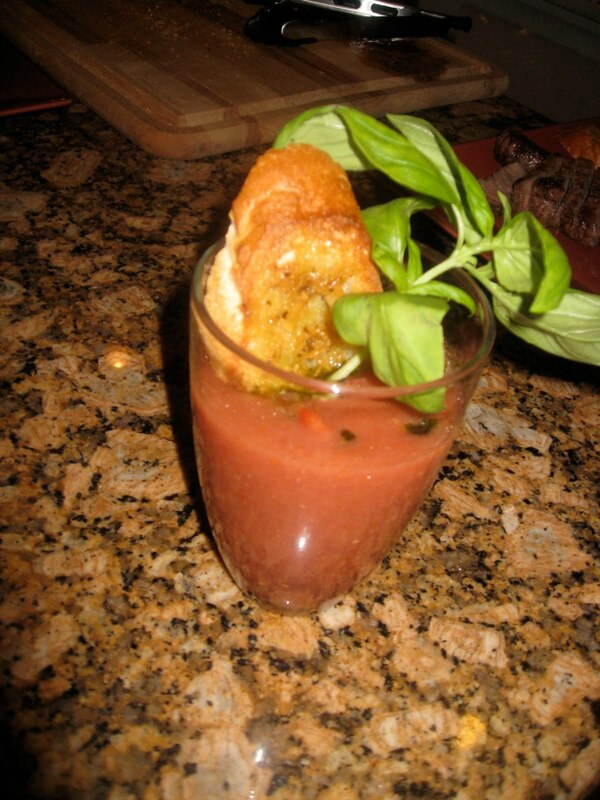 But every time I read a gazpacho recipe, my first and only thought is "yuck." It just seems wrong for soup to be cold. Then I read a post about gazpacho at the Foodinista blog (you can find the post here), and I just felt I had to make it. The way she spoke about gazpacho was so passionate and inspiring, and when I clicked through to the original recipe by renowned chef Jose Andres (where it's poetically named Andalucian Cold Tomato Soup), I was sold. I pictured a beautiful glass pitcher in my fridge, filled to the brim with fresh gazpacho, and me going back again and again to pour myself delicious bowl after delicious bowl, pumping my body full of antioxidants, lycopene, and other vegetabley goodness. So I went to Whole Foods and bought all of the ingredients, except for oloroso sherry. I couldn't find it, and figured that regular old sherry would do. Plus since I wasn't sure if I would like it, I didn't want to spring for some expensive bottle of sherry that would rot in my cabinet. I followed the recipe precisely, but instead of making croutons, I toasted some baguette slices and topped them with a parmesan tapenade (store bought). The best way I can describe how I felt about it was "eh." I could tell it was good gazpacho, but I think I am just never going to love gazpacho - no matter how good it is. It was kind of like that time my husband and I went to a highly rated Mexican restaurant and waited two hours to try their world famous mole, only to practically gag on it. Apparently what we'd thought was good mole (from our favorite hole-in-the-wall Mexican place that probably poured their mole out of a can), was nothing like true, authentic mole. And I guess we hate true, authentic mole. The moral of the story is...if you like gazpacho, this recipe is worth trying out. If you don't like it, I don't think this recipe will win you over. Alas, my quest for the perfect cool lunch on a blazing hot day will have to continue. There's a Simpsons episode where Lisa tries to convince everyone to give up meat by tempting them with gazpacho. "It's like tomato soup, but ice cold!" That was enough for me to know I'd never try it. Ew. :) There are so many healthy foods I wish I could make myself like! Alas I am not a fav of the Gazpacho either! not a *fan* of the Gazpacho.... see i need the extra brain food if i could just swallow it down! I know, sometimes I read about super healthy foods people make and claim to enjoy, and I'm like: but did you *really* enjoy it, or did you just tell yourself you did because you really wanted to. Well, I've decided my butternut squash soup (which is served hot), is the closest I am going to get to a really healthy soup. I have tried gazpacho soup, but am like you and am not a fan of it. my friend's mom makes an absolutely delicious chunky vegetable gazpacho using spicy v8...I didn't like gazpacho until I tried it.